I don't know if I say it enough, but this blog has always been about expanding mine (and hopefully your) appreciation for all kinds of frozen dairy desserts. Sure the focus is quality ice cream, but remember, if it's in the ice cream aisle, it's fair game. Today's review is no exception, though I did have help to get here in the form of a bright yellow 50% off sticker. I can't say I would have made this Häagen-Dazs leap of faith on my own, but now that I'm here, I'm glad I forgot about the past and tried something new. See, if you are like me, frozen yogurt makes you think of one thing: soft serve TCBY. I remember long ago when TCBY came to our mall and I remember trying it...it wasn't horrible, but I'll never forgot that awful aftertaste. Granted, I was young and my tastes were limited, but the experience was powerful enough to keep me from ever wanting to try frozen yogurt again. Things change. People change. Tastes changes. We become older and hopefully wiser. I have actually been debating frozen yogurt for a little while, though I don't know if Edy's would have been the right choice. I had finished that last pint of Häagen-Dazs earlier in the day, and I really wanted more when I went to the grocery store. 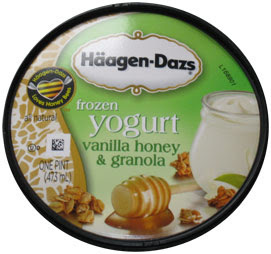 Sales were limited, and then I saw it, Vanilla Honey and Granola frozen yogurt. Well, the mood (and sale) struck me right and I brought that little guy home. Ok, let's get to the review already. Now, I don't love it, but I am very impressed, mostly by the fact there is no after taste. My only real compliant is the honey. I'm just not a big honey person. It's fine if it's mixed with something, but not when it's strong, and it's strong here, by far the most potent of the ingredients. However, the quality is excellent, it goes down real easy, and I even love the way they mix in the granola. I guess I'm just really impressed that some flavor engineers sat down and said "we're going to bring top notch Häagen-Dazs quality to frozen yogurt". For me, someone who despises frozen yogurt, to sit there and almost give into the urge for a second serving, that's huge! You know, I think I was almost getting use to the honey there at the end. It's different, it's quality, and it's got *8* grams of protein in a single serving (must be the egg yolks). I may just have to try some of the other flavors! Look Ma! I'm eating my yogurt! On Second Scoop: I really want to love this product but I just can't get over how potent the honey is. It's a shame really because it will prevent me from buying this particular flavor again.